Prime Minister David Cameron has reportedly offered the use of three helicopters, two Border Force cutters and the battleship HMS Bulwark to aid search and rescue efforts. The drone is launched into the air from a ramp on board the ship, and has the capability to remain airborne for up to 12 hours. The source added that the HMS Kent, one of the types of boats compatible with drone use, could be moved to the Mediterranean to join the search and rescue efforts. 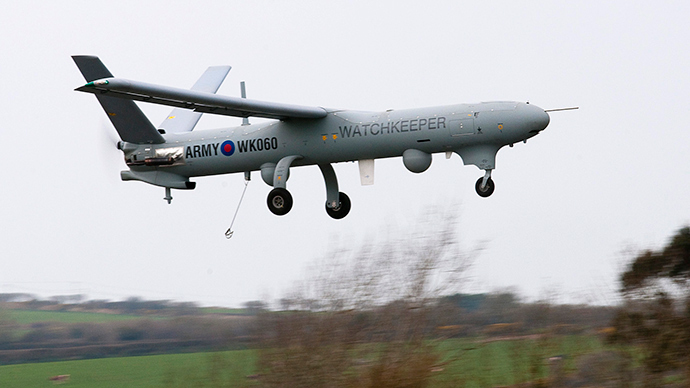 The drone itself is operated by a naval squadron nicknamed the “X-Men” and has been used as surveillance equipment in the hunt for drugs rings and pirates since its introduction in 2013. It was announced last week that European leaders would triple the current finding levels for search and rescue operations in the Med. Both Labour leader Ed Miliband and UKIP chief Nigel Farage have publically blamed David Cameron and the coalition bombing of Libya for the increased numbers of people fleeing the country. Speaking last week in London, Miliband said the post-conflict plans had failed, leading to the destabilization of the country. The airstrikes carried out in 2011 by a UN-authorized coalition of France, the UK and the US saw Colonel Gaddafi’s regime collapse. The country has since been plagued by political insecurity, with no single functioning government emerging. “Since the action, the failure of post-conflict planning has become obvious. David Cameron was wrong to assume that Libya’s political culture and institutions could be left to evolve and transform on their own,” he said. “The tragedy is that this could have been anticipated. It should have been avoided. And Britain could have played its part in ensuring the international community stood by the people of Libya in practice rather than standing behind the unfounded hopes of potential progress only in principle,” he added. Libya has been increasingly used by migrants attempting to cross into Europe and is plagued by trafficking gangs.